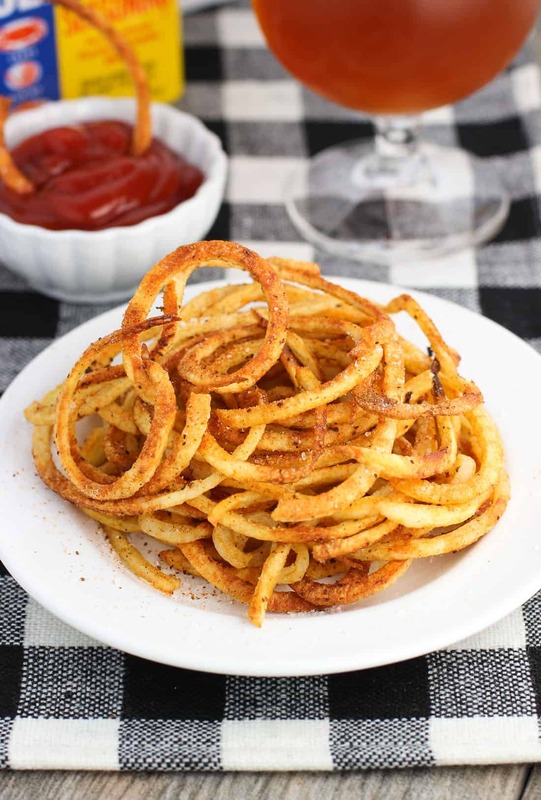 These Baked Old Bay Curly Fries use a spiralizer for a quick side dish or snack recipe. The fries are baked but crispy, and seasoned with that awesome, slightly spicy Old Bay flavor. These won’t last long! My life post-obtaining-a-spiralizer continues to get better now that curly fries have come into the picture. Curly fries! As if a kind of greasy and salty guilty pleasure needed any help in the crave-inducing department, someone (who I wonder?) decided to shape them into springy, fun spirals. All the better for eating a plate full, my dear. 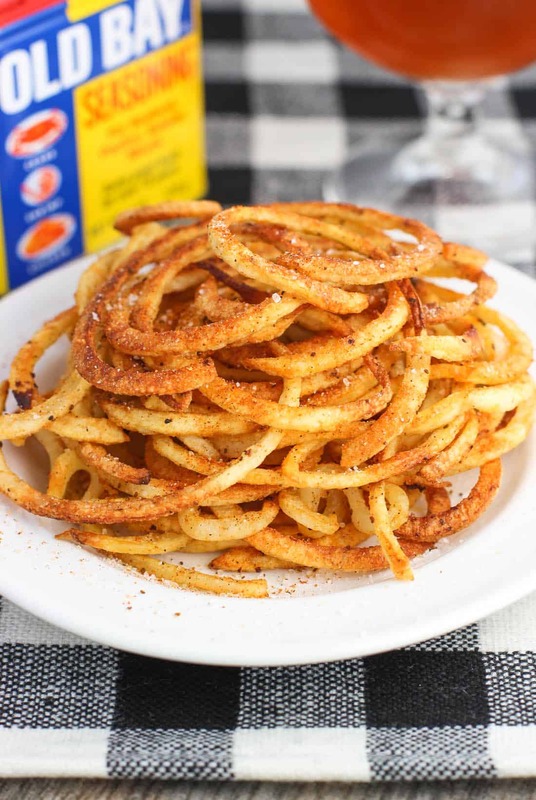 With those A+ credentials, it’s a good thing these spiralized baked Old Bay curly fries are healthier and totally crisp, with a salty, slightly spicy flavor. The number of recipes on my blog that use Old Bay are woefully small in comparison to the number of recipes we eat on the reg that incorporate Old Bay. If you’ve been reading around here before you probably know the drill. Brian is from Maryland and Old Bay may or may not be coursing through his veins. Hence Old Bay in meals and snacks galore. It’s a good thing I’ve come to love the zingy seasoning in that classic yellow box. 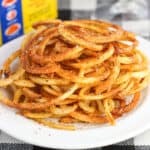 Making curly fries with a spiralizer is easy, especially baked Old Bay curly fries. Too easy maybe, because now I can’t look at my potato stash without imagining a gigantic mound of curly fries. I used the medium spiral blade for these fries, leading to the cook time in the recipe below. Keep in mind that using a narrower/thicker spiral blade will likely change the cook time, so adjust accordingly. Once the potatoes are spiralized, you toss them in a bowl with olive oil, Old Bay (duh), onion powder, salt, and pepper. A little hot sauce too, if you please! 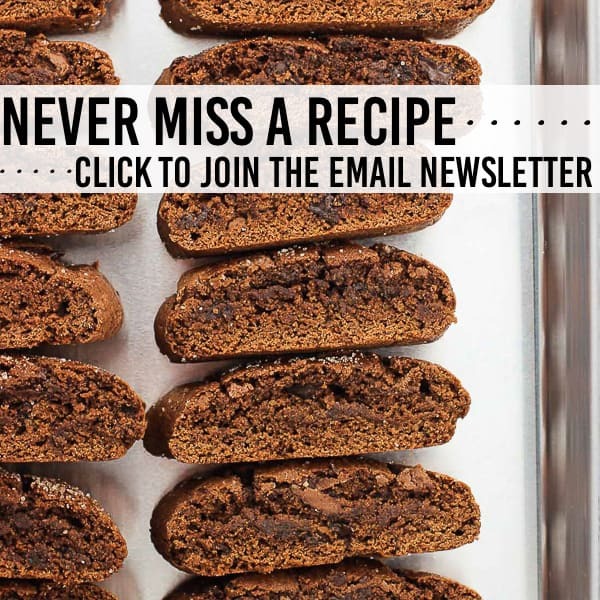 Place them on the baking sheet, bake (flipping once), and boom! Top with extra Old Bay and sea salt and dig right in. Because these fries are baked, they use only 1 tbsp of oil per potato. Hello, healthier indulgences! Use a relatively high temperature (these fries bake at 425 degrees F). Place the fries in a single layer, with sufficient room between fries. No touching! Crowding the fries into the pan is more likely to steam them than crisp them up. Steaming = soggy = no bueno. You want as much surface area of each fry to be directly against the baking sheet. Those parts against the sheet developed the crispest, deeper color you see in these photos. Now this is curly fry specific and speaks to the point right above, but do your best to stretch out any tight spirals you get. I found those pieces had a lot of the fry off the baking sheet, as well as spirals that were very close together (violating bullet point #2). This led to not-as-crisp fries that needed to be baked for additional time after the rest of the less tightly spiraled fries were done. Keep a close eye! Baked fries can go from perfectly crisp to burnt in a short amount of time. After you flip the fries, hang around the oven and check the fries frequently to see when the tops are browned. Every oven is different, so the times listed below may not match up exactly with what your oven requires. Okay, do I have you convinced? 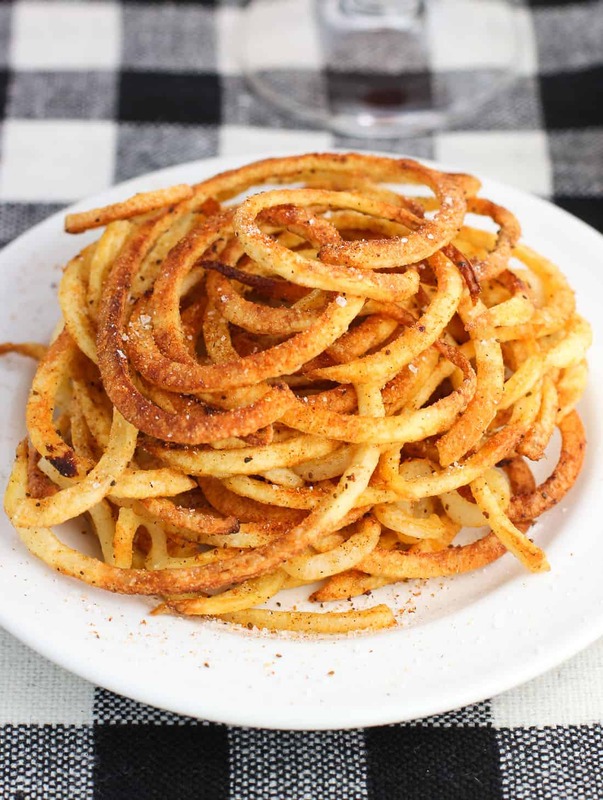 If you’re whole-heartedly, unabashedly in lurve with your spiralizer, put baked Old Bay curly fries on your menu! 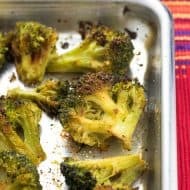 Preheat oven to 425 degrees F. Spray a large baking sheet with cooking spray. Spiralize potatoes and place in a bowl. If some of the pieces are very long, break them up to be a more manageable length. 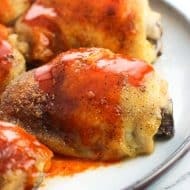 Add olive oil, hot sauce (if using), Old Bay seasoning, onion powder, salt, and pepper to bowl and toss to combine so the fries are evenly coated. Place fries in a single layer on the baking sheet, leaving space between each one. Bake for 10 or so minutes, and then remove sheet from oven and flip fries over. The bottoms should be browned. Place sheet back in the oven and bake for an additional 5 minutes, or until the tops have browned to your liking. Remove and serve. See tips on getting crispy baked fries in the post above! 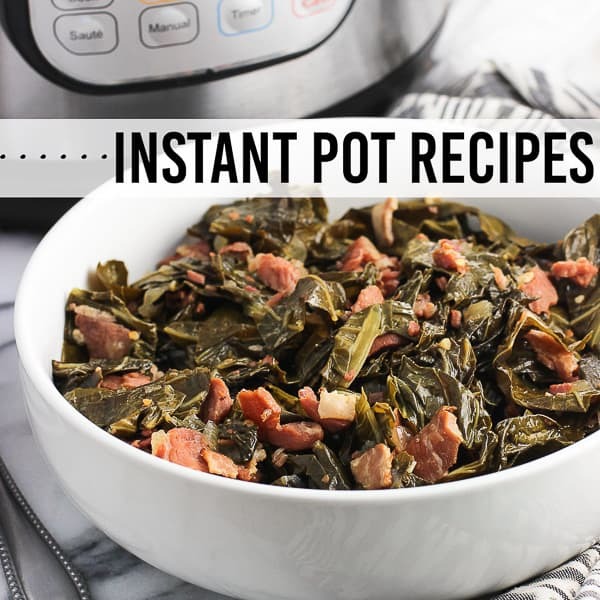 Recipe can easily be halved for a smaller number of servings. KitchenAid Spiralizer Attachment with Peel, Core and Slice <–just flip the ‘on’ switch and in seconds your fruit/vegetable is spiralized! And what could be a post about Old Bay without seafood? 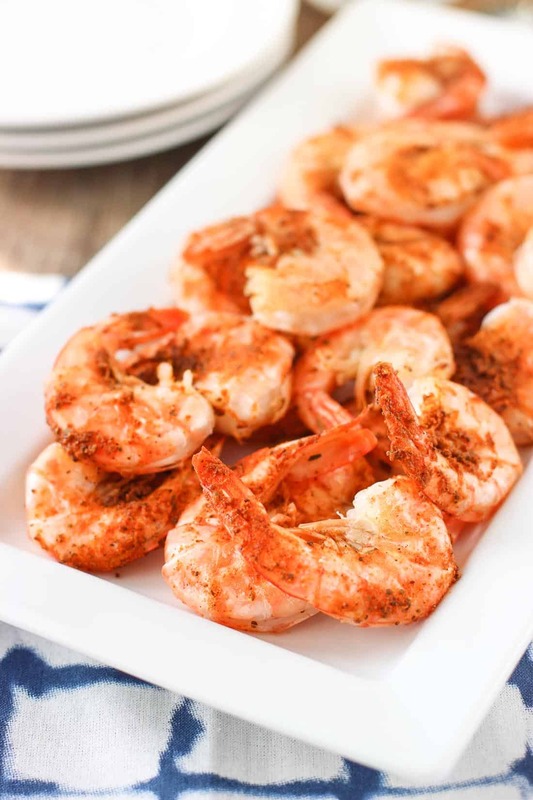 These Easy Peel and Eat Old Bay Shrimp are one of my very favorite quick meals/appetizers/small plates/whatever. Healthy, too! Hi! I just (FINALLY!!!) bought a spiralizer attachment for my Kitchen Aid mixer yesterday, and I am SO gonna try these fries this week!!!!!!! 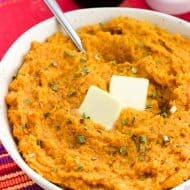 Perfect cheat day recipe!!!! What did I do wrong. Half Burt and half soggy. They were not touching plenty of space. Hi Janice, sorry to hear that! Were the fries all the same width? Smaller/thinner ones will cook faster and potentially burn before thicker ones are done. Try soaking the spiralized potato in water for 1 hour before baking. TRUST ME, this was a huge game changer!!!! 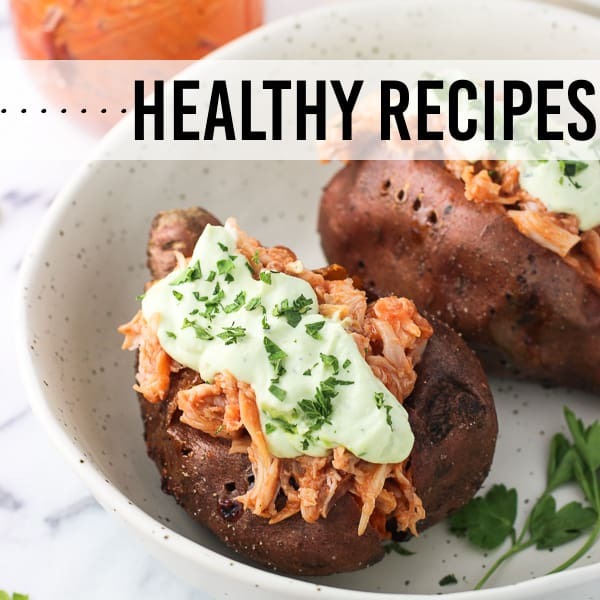 Do this with all starchy root vegetables to bake for perfection aka air frying. This is a great tip, Erica! I’ll have to do that next time with these spiralized potatoes. 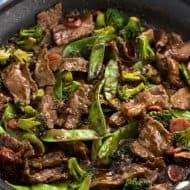 This recipe looks great, except olive oil burns over 400 degrees. Will try this at 375 and cook for longer. Hi Jeanette, thanks for your comment. I’ve researched and am comfortable cooking (and in this case baking) with olive oil at 425 degrees. That said, absolutely change up the temperature and cook time to fit with your preferences. 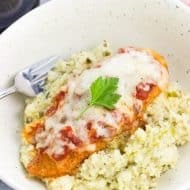 I always love when readers make a recipe their own! Or just use a different seed oil that does not break down at higher temps such as avocado or coconut. 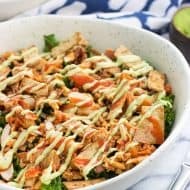 I just got a spiralizer and seriously can’t wait to try this recipe! You have so many great tips, thanks Alyssa!! Whoa!! We are having popcorn shrimp tonight I am so making these! I love the hot sauce too! Thanks Annie! These plus popcorn shrimp sound like an awesome dinner! I just recently got a NEW spiralizer and I’m looking for any and every excuse to use it sooooo yeah, these fries are SO going to have to happen here. 😉 I can hardly stand how perfectly crispy they look! Why have I not thought to make curly fries with my spiralizer? You’re a total genius, and these look even better than the unhealthy fries! haha They’re so golden brown and perfect! Thanks Marcie! Definitely easier than cutting potatoes into strips manually, too! Ah! I never thought of using a spiralizer to make curly fries…such a great idea Alyssa! 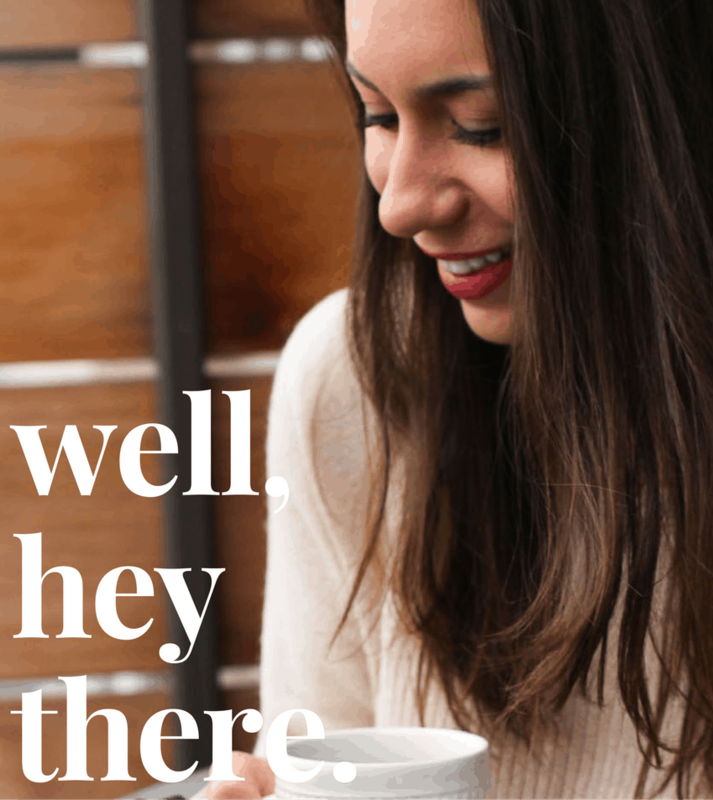 Pinning and sharing these! It works so well! It might be my new favorite thing haha thanks Jessica! Ah! Old Bay on fries is SUCH a classic! I haven’t had it in so long! But fries with old bay…dipped in ketchup…swoon! Yes, all the ketchup! Thanks Rebecca!